Agenebode is a water-side town located by the banks of the Niger River in Edo State, South South Nigeria. It is the headquarters of Etsako-East local Government council of Edo State and the traditional capital of Weppa Wanno Clan/Kingdom. Agenebode is bounded by Ivioghe, Egor, Emokweme villages, and the River Niger. Agenebode city is the home city of all Weppa Wanno people,both at home and in the diaspora despite various rivalries. 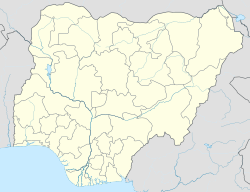 Agenebode is divided into different quarters, which are called Ighaewo, Egbado, Otoukwe, Igegbode (upland). The main areas of growth for the town are towards Emokweme, Egor and Ivioghe villages, Iviebua Igbagba. Agenebode was the regional headquarters of the Royal Niger Company, a mercantile company owned by the British Colonialists and currently the headquarters of Etsako East Local Government Area of Edo State. Educational institutions at Agenebode are the College of Agriculture and Fisheries, St. Peters Grammar School,Progress Secondary School, Providence Secondary School, Army Day Secondary School, Sacred Heart College, Catholic Junior Seminary School,and so many other Secondary and primary schools. Agenebode house a Nigerian Supply and Transport barracks of the Nigerian Army, and a Division of the Nigerian Police Force. The King of the Weppa Wanno Kingdom is called the Okumagbewhich is translated as the unifier, and his palace is situated at Agenebode Upland. The stool of the Okumagbe is rotated among the five kinship groups. Presently (Dr) George Oshiapi Egabor, JP, PhD,OON a Chartered Accountant and Industrialist from the Iviokpisa kinship group, is the current Okumagbe of the Weppa Wanno; his title is OMOAZE 1. Residents of Agenebode are predominantly Christians as the first catholic mission in Mid-Western Nigeria was located at Agenebode in 1882. There are also Muslims and traditional worshippers. Interesting sites in Agenebode are the post office, built in 1930, the Colonial Court on Mission Road, the Sacred Heart Catholic Church, the Local Council office, The Army Barracks, General Hospital, Niger Valley Farms, the River Niger banks, the Notre Dam Hospital, and the Convent. The main means of transportation in Agenebode is by motorcycles, buses and cars. Canoes, boats and ferries transport people across the River Niger to Idah in Kogi State. Traditional occupations are farming, fishing and canoe-building. Local agriculture produces maize, nuts, groundnuts, sorghum, rice, vegetables, potatoes, Cassava, Yam, fruits etc. The local cuisine are-Corn Soup (Omi-ukpoka), peanuts soup (omisagwe), melon soup (ikotipio), fresh fish soup (omiesegbomi) etc. ; these soups can either be eaten with pounded yam, Eba, Fufu etc. ; Agenebode people drink locally made gin and fresh palm wine.